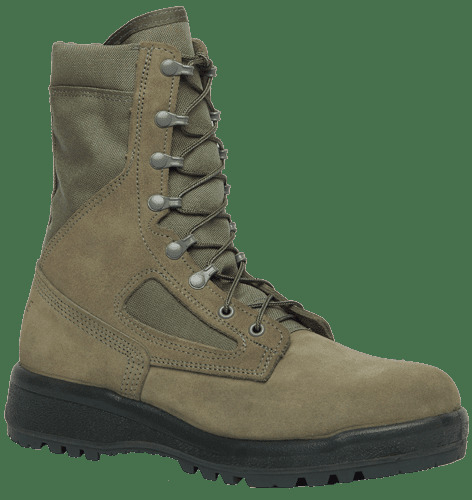 The Belleville 600 CT Men's Hot Weather Sage Green USAF Composite Toe Military Boot was incorporated Belleville's latest military boot technology. A lightweight composite toe provides ASTM protection from falling hazards. 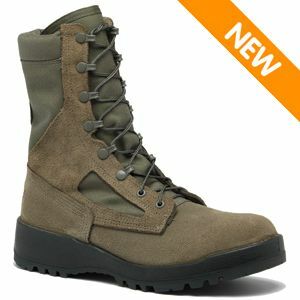 These comfortable, hot weather boots are made from full grain cowhide and ballistic nylon fabric for maximum durability andt tough abrasion resistance. An unlinded upper promotes breathability and cooling of 600 CT means that your feet will be cool in the hot combat environment. And the polyurethane insole makes your feet comfortable in those long duty hours. The Vibram sole provides excellent traction in smooth and uneven terrain while a cushioned polyurethane midsole gives "running shoe" level comfort during long duty shifts.